Cyber Security is a growing threat in society and the options available to help mitigate the risks are limited. This forward thinking Chicago startup, ThirdPartyTrust, is a SAAS provider of a platform called “Vision,” which helps enterprises as well as the vendors that work for them manage and monitor their potential risk of causing a data breach. 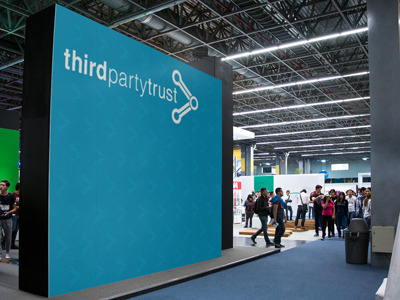 ThirdPartyTrust’s existing logo was corporate in style, generic in design and uninspiring for the team. They asked us to help with redesign of their logo that better fit their fast paced, innovative and entrepreneurial spirit. It needed to quickly tell a story, relate to their product and connect with executives of Fortune 1000 and niche vendor companies or individuals who they were offering their service to. Not to mention, it had to attract creative, motivated and smart job seekers to join the growing tech start-up. ThirdPartyTrust has built a lot of momentum since the logo redesign was implemented into their marketing to new customers. It, along with the new marketing message has helped in pitching new business and clearly communicating the benefits of the product in a concise way.